Pears are a wonderful fruit that can be difficult to bake with because they are so delicious on their own that you don’t always want to try them out in a recipe. But pears can also be wonderful when they are cooked, as their delicate flavor only gets more intense when the fruit spends some time in the oven. TheseÂ Caramel-Roasted Pears are one of the simplest and most delicious desserts that you can make with fresh pears. 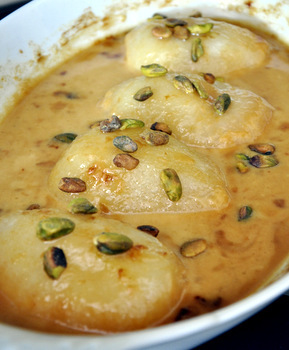 The pears become sweeter and more tender in the oven, and the easy caramel sauce goes perfectly with them. The pears are peeled and halved, then placed in a baking pan and sprinkled with sugar. The sugar and the natural juice from the pears combine to form a flavorful, light caramel while the pears are roasting. Cream is added towards the end of the cooking time to transform the caramel into a caramel sauce that can be served alongside of the pears. I like to eat them as-is, or serve them with scoops of vanilla ice cream. I also like to add a sprinkle of nuts – toasted pistachios, walnuts or pecans – to the pears before serving to add a little crunch. The recipe doesn’t require much sugar, but you shouldn’t skimp on it unless you want a sauce that is more cream than caramel at the end of the day. For a stronger caramel flavor, use brown sugar instead of regular sugar on top of the pears. You don’t need pears that are perfectly ripe to make this recipe. In fact, pears that are still on the firm side will be a little bit easier to peel and work with, and will still get perfectly sweet and tender in the oven. I used Bartlett pears, but this recipe will work with Bosc, Comice and other types of pears, as well. The other terrific thing about this recipe is that it can be adapted to any serving size. If you only have one pear, you can make it by scaling back the caramel sauce slightly. If you need to serve a crowd, you can use a dozen pears in two big baking dishes to make a big batch without having to change the baking time. Peel pears and slice them in half. Remove the stems and seeds, then place them cut-side-down in a large baking dish. Sprinkle pears evenly with sugar and salt. Roast for 30 minutes, until pears are tender and a golden brown caramel is bubbling in the pan. Pour heavy cream and vanilla into the caramel around the pears and bake for an additional 10-15 minutes, basting the pears once or twice with the sauce during that time. Allow pears and sauce to cool slightly and sprinkle them with chopped nuts before serving. Sauce will thicken slightly as it cools. 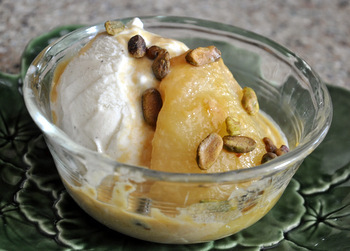 Serve each pear half with a scoop of ice cream and a drizzle of sauce. Serves 4 (1/2 pear per person).